Hundreds more people may have died in Iran's post-election unrest than the authorities have admitted, amid allegations that the death toll has been obscured by hiding victims' bodies in secret morgues. Human rights campaigners say anecdotal evidence suggests the number of demonstrators killed in clashes with government forces after last month's poll was far higher than the official death toll of 20 and may amount to a "massacre". Suspicions have been fuelled after one woman described seeing corpses piled on top of each other in a refrigeration depot while searching for a missing relative. Another woman was shown pictures of between 50 and 60 people, all said to have died, while searching for her son. The claims came as Tehran prepares for another day of tension tomorrow when the influential former president Hashemi Rafsanjani addresses Friday prayers at Tehran University. Hardline supporters of President Mahmoud Ahmadinejad – who was controversially re-elected in the election on 12 June that opponents say was "stolen" – have threatened to disrupt the event, at which Rafsanjani is expected to speak in support of his ally Mir Hossein Mousavi, the defeated reformist candidate, who will attend the event. It's a long way from Tehran to Zahedan, in Iran's remote south-east, but the hanging of 13 convicted terrorists this week sent out a chilling message about the readiness of the Islamic Republic to act ruthlessly to defend its core interests. On the face of it, there was no link between the mass execution and last month's disputed presidential election, in which Mahmoud Ahmadinejad won a second term. But these and other recent judicial killings may be designed to intimidate at a time of unprecedented unrest and uncertainty about Iran's future. 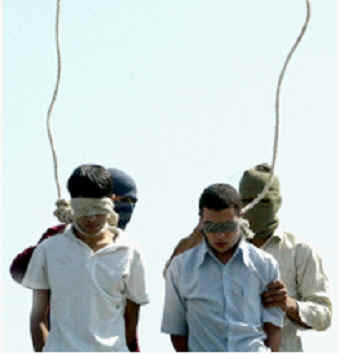 The 13 men who mounted the gallows early on Tuesday morning were not supporters of Mir Hossein Mousavi, officially defeated by Ahmadinejad, but members of Jundullah (Soldiers of God), a small Sunni rebel group. The worst of its attacks was the suicide bombing of a Shia mosque in May, which killed 25 people in Zahedan, the capital of Sistan-Baluchestan province, which has a Sunni majority. Jundullah claims to be fighting for the rights of Iran's Baluch minority but is often linked by the regime in Tehran to al-Qaida, and to the west. It has been blamed for drug smuggling, kidnapping and attacks on civilians and revolutionary guards and appears to be based across the border in Pakistani Baluchistan. Iranian media quoted one of the condemned men as "confessing" that the group was trained and financed by "the US and Zionists". The hangings were to have beenin a public park but in the end took place inside a prison compound. A 14th man, the brother of the group's leader, Abdulmalik Rigi, was given a brief stay of execution - but only to allow him to undergo further questioning. The charges, in the inimitably stark language of Iranian Islamic justice, included moharebeh - "enmity against God" as well as being "corrupt on earth, killing innocent people and taking hostages while carrying firearms."